Everything you need to start playing straight out of the box! 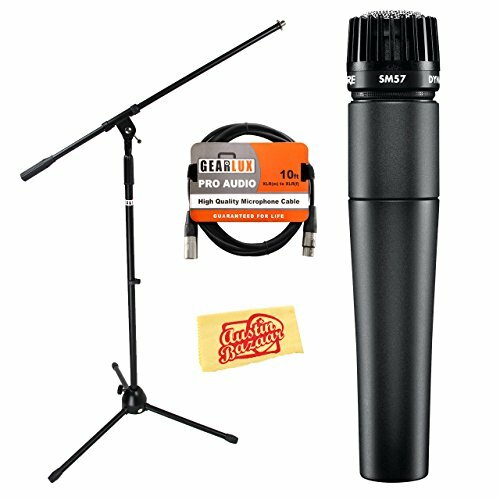 Bundle includes Shure SM57-LC Instrument/Vocal Microphone, Gearlux Boom Stand, XLR Cable, Windscreen, and Austin Bazaar Polishing Cloth. Few microphones have the reputation for quality and durability that the SM57 has built up since it first hit the market in 1965. Since then, this product has been an industry benchmark to which all other studio microphones have been compared. It can be seen anywhere, from small clubs to sports stadiums, and has been used in the studio by many of the world's greatest musicians. The SM57 is one of the most versatile microphones on the market. This dynamic product can handle the highest sound pressure levels without distortion, making it the perfect choice for recording high-volume instruments like drums. Many hit recordings feature the SM57 on the snare, as it can handle the noise without distortion. This product is also perfect for use with high-volume amplifiers. The SM57 can even handle close up recording on half-stack amps that are painfully loud for human ears. This microphone will help you to bring the feel of a live performance to your recordings for a better representation of your music. While this microphone is notorious for being used in the studio to record the sounds of percussion, wind, and string instruments, it also provides high quality vocal recording. Whether you are using it for spoken word or vocals, the SM57 will deliver a flawless sound while eliminating background noises. Because of its reliability, sound isolation, and quality sound reproduction, the SM57 has been used at the podium for Presidential speeches for the past 40 years.